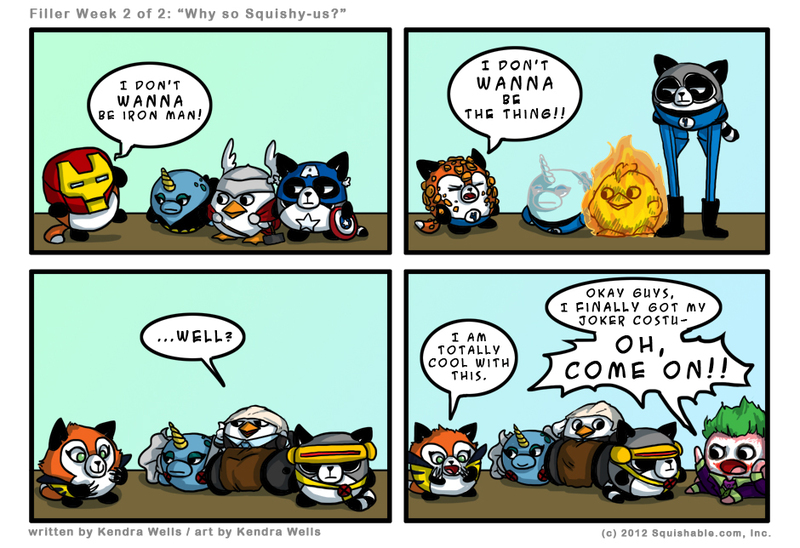 The Fuzzy Five - Filler Page 2: Why So Squishy-us? Filler Page 2: Why So Squishy-us? Sorry for the late update, everyone! Page 2 of the Fuzzy Five filler from Kendra! Yay! Starting Monday, we’ll be back on schedule with our heroes, who are back in action! Any excuse to have Squishies in costumes! Aw… SO cute! I love squishables, but they are quite pricey… This comic is really cool though! Who is Nina Jr. supposed to be in the Avengers? The Wasp? @aslogan, I assumed she’s meant to be Black Widow. I can’t figure out which of the X-Men she’s supposed to be, though. Storm? Yeah, judging by the cape I’d guess storm. Man, I want a squishable fox or raccoon like Spirit or Nightshade. I’d name them Bandit or Chloe but they are waaay too pricey. XD <3 XD <3 XD <3 XD <3 OH MY GOODNESS I LOVE THIS SO FREAKING MUCH!!!!!!!!!!!!!!!!!!!!!!!!!!!!!!! I am a HUGE Marvel fan and this is just plain amazing!!!!!!!!!!!!!! I love it!!! !